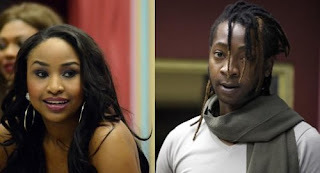 Zimbabwean housemates Roki and Maneta have been disqualified from the Big Brother StarGame house . The two of them were asked to pack their bags and leave the house after they got engaged in a physical confrontation. The video above shows what ensured between them before they were disqualified and told to say their goodbyes. It all started as a joke, Roki poured water over Maneta's head and Maneta threw cleaning fluid in Roki’s face. Big Brother also said Maneta threatened to stab Roki although i cant seem to find it in the video above. Where is their sense of humor?